Ladies, celebrate the Valentineâ€™s season by showing your skin some love! NeutrogenaÂ®, the brand recommended by dermatologists, is now offering a special promo for its revolutionary facial cleanser â€“ the NeutrogenaÂ® Wave. 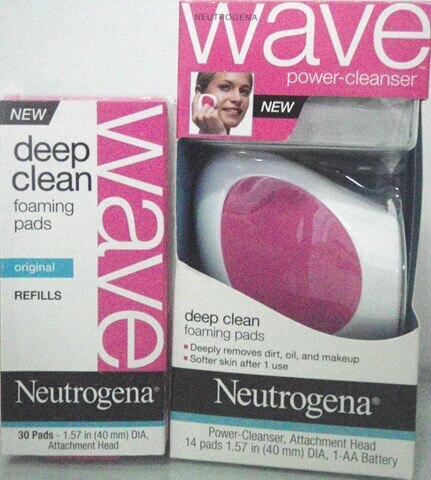 Get a 50% discount on NeutrogenaÂ® Waveâ€™s Deep Clean Foaming Pad Refill pack of thirty (30) foaming pads! Simply purchase a NeutrogenaÂ® Wave starter kit from January 28 to February 24, 2010 in all Watsonâ€™s and all Beauty by SM outlets. The NeutrogenaÂ® Wave starter kit includes the power cleanser gadget, two-week supply (or 14 pads) of single-use foaming pads and one AA battery. Proven to clean the skin ten times deeper than traditional facial cleansers, the NeutrogenaÂ® Waveâ€™s tingly cool foam penetrates deeper into pores while the gentle vibrating motion stimulates and opens the skinâ€™s surface to remove more dirt, oil and make-up. At the same time, the softly textured Deep Clean Foaming Pad sweeps away layers of dead skin cells for visibly softer, smoother skin after just one use. Avail of the thirty-day (30) refill packs for half the price at Php 200.00, with the Wave starter kit, and experience a deep clean for a refreshed and remarkably softer skin that you will surely love! After all, providing superior cleansing for your skin will help you look your best as you spend Valentineâ€™s with your special someone or your best friends. Great site! Have you tried this product? When I first heard of this, I was really excited on getting one. But then I have read that it didn’t really offer deep cleansing as it claimed – as what the other people on the net say. I am dying to try it though. I guess I have until the 28th to think it over. LOL!